Card Backs. 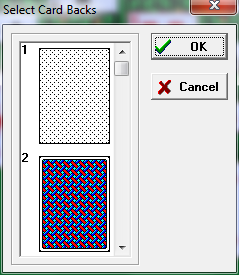 This option allows you to control what design will appear on the backs of the cards. To use this option, select "Options->Card Backs" from the menu bar. The dialog box will present a list of card-backs. Currently there are 12 different card-backs. Simply browse through the list and select the one you like. When you've found the card you want, click on it with the mouse cursor to highlight it, then press "OK." The card will now be displayed with this card-back. To make the selected card-back the default, use the "Save Defaults" option described below.